Love squirrels? Hate squirrels? Either way, we understand: Squirrels are that sort of rodent — cute yet annoying, fuzzy yet sometimes smarter than humans. This is the place to vent your squirrel fascinations and frustrations while also catching up on the latest bits of squirrel news. My name is Joy. I’m a big animal lover, but even I know that animals, like humans, can certainly be annoying. The first time I realized just how insane squirrels are is when we planted a roof garden in NYC. Try as we might, my husband and I could not figure out why our cilantro seemed to grow a few inches, and then suddenly disappear. And for some reason, peanut shells started showing up, too, scattered across the roof. What the? I caught the fluffy tailed culprit when I was enjoying some roof-top sunshine. It was a common gray squirrel stealing my herbs. He apparently had a nest in an abandoned air conditioning window unit. I watched him one day, taking an elaborate path, crisscrossing and jumping across various apartment roofs — just to get to my precious garden and devour all our baby greens and herbs. It was then that my complex relationship with squirrels started. And why I’ve now brought this blog to you — to document that complicated man/squirrel relationship. And document some cute squirrels! And….since 2010, my husband and I have been lucky enough to watch squirrels not only in NYC but also at our new cabin in upstate New York, where we have a plethora of rodents, including grey squirrels, red squirrels, chipmunks, mice and voles — it’s fantastic. Until they try to get in our house or eat all our flowers. I blog more often at El Blog de Joy. “You’d be surprised how many stories fall into the Squirrels Squirrels Squirrels blog beat.” — The Seattle Post Intelligencer’s Big Blog. Hi Joy ~ I just left you a comment on your other blog and then followed your link to this one. I am excited to read your entries here. Thanks for the story June! Red squirrels are hilarious! Love your site! I’m a big fan of squirrels myself…even though I was bitten on the finger by one (on full moons, I get a hankering for nuts). Thanks Phern! Love your name, btw. Love your blog! Check out my flying squirrel in my myspace photos! Your site maybe the greatest thing I’ve ever seen on the internet. I thought I was alone in my curious fascination with squirrels, and yet here you are (you and all these other folks who seem equally taken with out little rodent friends). Keep up the great work. i maintain a squirrel blog on Livejournal called Squirrelylove. we link to your page and i thought i’d spread the word of the squirrel! check it out sometime! Hello – We found and rescued a baby squirrel after a storm damaged a lot of trees in our neighborhood about 6 weeks ago. He is thriving and we are preparing him for release in the next couple of weeks. Although we will miss having him in our home, it is clear that a house is no place to contain him long term. He has been such fun for our family, and what an education! He wrestles and plays, and makes different noises depending on whether he is hungry, tired or wants to play, and comes when called at least as well as a cat does. He is an almond fanatic, and can unzip a backpack pocket or open a plastic drawer to get one. I have never really noticed squirrels other than vaguely registering that there seem to be a lot of them ‘around,’ but now I find that I am intrigued with their antics and habits, and often stop to watch them at play. Maybe a little ‘obsessed’ even, like (I’m sort of relieved to find) some others commenting here! So, we would like to be able to identify him in the future among the other squirrels playing in our trees. Does anybody know if there is a safe way to band or mark a squirrel? So, I clicked on your website and cannot find it any where. Do you know the story I am talking about. I send squirrel stories to a group of friends once a month and I thought that would be a good one to look at. You are doing some great work here. Squirrels are much more than they appear, and the world needs to be aware of the possibility that one day they will stage a glorious uprising and replace humans as the dominant species on the planet. In preparation for this day, I have cultivated my relationships with squirrels by feeding them well and begging them not to kill me whenever I see them. I advise you all to do the same. I live in Fairfax County, northern Virginia and spent time in nothern Oklahoma; until recently have only seen ‘the common’ gray squirrel and a few black ones of the same size (these in Virginia), not noticably larger though I read the black variety from whence they came in the U.K. are larger and so will overtake gray colonies in the states…now my job has me driving throughout Leesburg (just westward of F-fax County), Loudoun County, Virginia and into the countryside where there are hills, not mountains. One day I thought I saw a groundhog on a fencepost, which promptly jumped off and ran directly away across the field. Halfway across I noticed the undulating motion and its tail, still, its size and color had me baffled; only until it went up the tree did I accept it as a squirrel- then nothing for two months ’til I caught sight of more of this auburn red variety w/ a sharply delineated underside the color of a camel-hair jacket. They are practically twice the size of a small gray squirrel. Enough-until in wet weather this morning I saw a similarly large animal but, as far from from red as gray would be, except not gray. Clearly its fur was wet as it was kind of laid ‘up’/ too short to be referred to as clumped together, revealing a darkness farther in yet white on the surface. A visual anomaly? I drive through this subdivision daily and will make it a point to clear this up. Please let me know if you’d like to review a copy of my e-book SQUIRRELS IN THE HOOD! 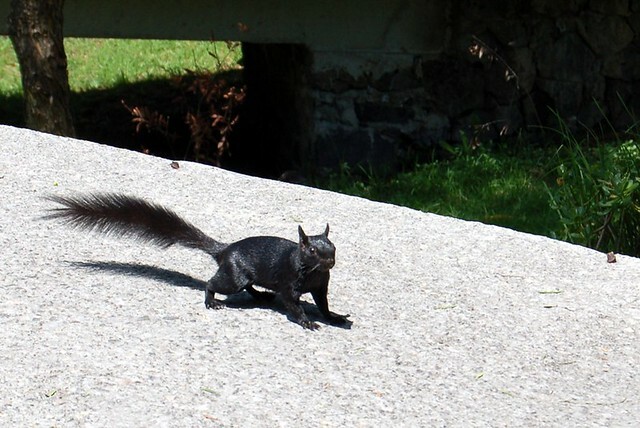 I saw that same squirrel in 1981, pigeon park at 21st & Constitution, N.W., right? Or its grandpa, maybe. I’ve seen red, black & gray but never a white one. This one was a first. OMG, I think this is a match made in heaven…check out our new web series called “SQWORLD” on Youtube…It was recently picked up by College Humor. Thanks for the squirrel fun. You interlace squirrels and culture and somewhat modern living. I love the flower photos on El Blog de Joy. Nice to get close-ups of butterflies isn’t it? I too have a place in NYC, and am lucky enough to have one out on Shelter Island, where I am working on a photo essay about squirrels and birds, and all the backyard wildlife. Would be curious about what you think, if you have the time. Joy: I love your blog. I am a big squirrel lover. I was involved with squirrels for seventeen years. I now write a blog here at wordpress too: mylifeasasquirrel. I am telling the stories the squirrels wrote in my life and I would like to invite you to visit. Funny coincidence: I had a squirrel I named Joy – I called her Joy-Joy. I had her for eight years and I miss her immensely; she was adorable.